Since 1994, students of the Sophie Scholl High School have been researching the history of their school during World War II. 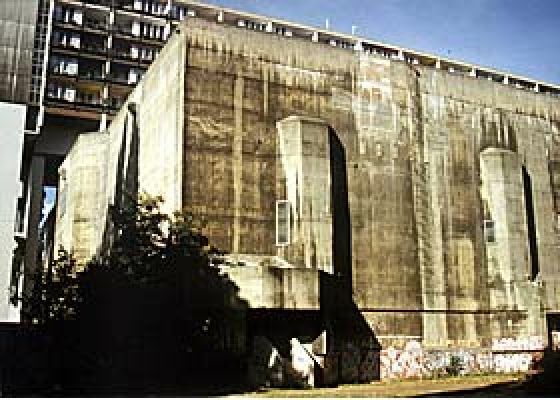 From 1943 to 1945, the "Augustalager", where Soviet forced laborers were interned, was located where the school is today. The workers were forced to build an aboveground bunker, which still stands on the school grounds today. Recently the students conceived and developed a "Place of Remembrance". In 1994, Maria Derewjanko from Lviv/Lemberg in the Ukraine wrote to the Sophie Scholl High School (then called the Augusta School), addressing the letter to the "Augusta School. Izhold Street - Palaz Street. Gray building on the corner" [see documents]. We were lucky that the letter, in which Mrs. Derewjanko asked for confirmation of her internment in the former school in order to qualify as a war victim in the Ukraine, ever reached us. It became the starting point for contacting other surviving forced laborers, and for various school research projects on the history of the Augusta School during World War II. At the same time, the letter was the beginning of a friendship with the entire Derewjanko family. The Sophie Scholl High School first issued Maria Derewjanko an official invitation via the German Embassy in Kiev, so that she could visit Berlin again in October 1994, 49 years after she was interned there with her family at age 12. Her description of the years 1943 to 1945 helped us visualize the history of our school, where a camp for Soviet forced laborers had been located, as well as that of the district of Schöneberg. We knew of the shadows of the past from hearsay, but up to this time we had neither documents nor contemporary witness reports. "After the Augusta School had been evacuated, this building housed a camp for Soviet forced laborers from 1943 to 1945. They were moved here together with their children. All those capable of working had to build the aboveground bunker on Pallas Street. The school was hit during a bombing raid at the beginning of February 1945, and many of the prisoners lost their lives." It is not only with this memorial plaque, one of the only ones in Berlin that commemorates the forced laborers, that the Sophie Scholl High School seeks to deal with its past. Seventh grade history class traditionally begins with a unit on "The White Rose", in which the students learn about the activities and the meaning of the girl their school is named after. Even at this stage I had several opportunities to study the history of the forced labor camp 'on site'. The starting point was always the memorial plaque in the entrance, which the students asked about. Our project group on "forced labor" keeps regular contact with other contemporary witnesses, and learns more and more about the conditions in the former Augusta Camp through talking with them. [See documents]. Wassilij and Katerina Derewjanko, brother and sister of Maria, were already able to visit us several times through the generous financial support of our promotion association and the District Office Schöneberg, as well as by donations. Wassilij Derewjanko estimates that there were more than one hundred forced laborers in the Augusta Camp, who had to build the communications shelter under orders of the "Deutsche Reichspost" (German Post Office of the time). The shelter still stands on our school grounds today. Meeting Katerina Derewjanko led us to Liebenau/Steyerberg, near Nienburg/Weser. In 1942 she was deported to the "Eastern Workers' Camp Steyerberg", and forced to work in the Gunpowder Factory Liebenau. In cooperation with the "Gunpowder Factory Documentary Center", an organization studying the history of forced labor, we organized a trip to Liebenau for Katerina Derewjanko in May of 2000. The visit focused on conversations with contemporary witnesses, in which students from the local High School and the High School in Nienburg took part, and on visiting the places where Katerina had had to live and work. Together with the students from Lower Saxony, our project group documented the meetings photographically, interviewed Wassilij and Katerina Derewjanko in detail, and made a video. In the summer of 2000, a delegation from Berlin and Liebenau visited the Derewjanko family in Lviv and Krasne in the Ukraine. In the autumn of 2001, a brochure will be published on the Derewjanko family's forced labor in Berlin and Liebenau. The students in the project group are not only concerned with reconstructing the history of the "Eastern Workers'" camp at our school, but also make sure that their friends from the Ukraine regularly receive gifts and financial support. At Christmas there are also toys for the children [see audio/video]. They also helped Wassilij Derewjanko to get medical treatment, so that he was able to visit us a second time in Berlin. A contribution by the Philipp Holzmann Company, which had overseen construction of the bunker, was a great help in this. The students also publicize what they learn about this dark chapter of the bunker and the forced labor camp formerly on their school grounds. For example, in the exhibition "Soviet Forced Laborers in Germany", organized by the 'Contact Association', students from the project group contributed their comments on the current debate concerning the remuneration of forced laborers. The exhibition opened to the public in the Red Rathaus, Berlin, in June of 2000 [see documents]. The group's experiences from meeting with the former forced laborers and their families are also documented in detail on the Sophie Scholl High School's website [see bibliography]. Our current project is to transform the communications shelter into a memorial and a "Place of Remembrance". Conception and organization of a "Place of Remembrance"
The bunker that Russian forced laborers began was only completed in 1989. Today it serves as a shelter in case of catastrophe. For the students at Sophie Scholl High School, who met some former forced laborers, it has however become much more: a place of remembrance, documenting the oppression and suffering of adults and children right in the middle of Schöneberg. The main goal of our current project is to call public attention to the history of the bunker and the forced laborers. The students (10th - 12th grades) are developing it in a joint Art and History workshop, which began in February of 2000 [see audio/video]. After obtaining official permission to create what would be Berlin's first monument to forced laborers, it was time to decide what it should look like. Art teacher Andrea Busse and myself lead our "Monument Builders, Inc.", with the help of sculptor Christina Artola. The students presented their plan to the plenary of the North Schöneberg Präventionsrat: a sculpture in metal to trace the former camp boundary and show the path connecting the school buildings to the bunker construction site [see photos]. Its blue design harks back to the blue badges labeled "Ost" ('East') that the so-called Eastern Workers had to wear. 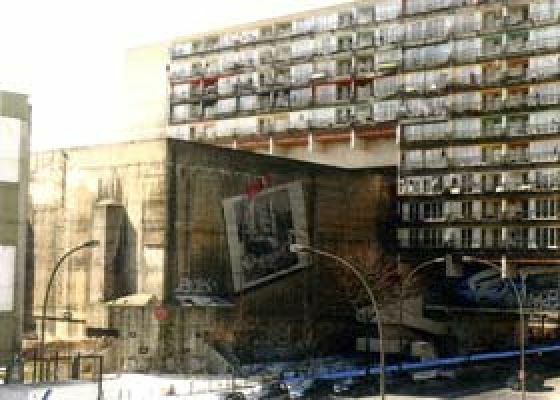 The bunker's façade will show a large reproduction of the badge. The sculpture contains students' answers to the question "What did I think when I first saw the bunker?" [see photos]. Some of the answers are: "Did the bunker protect people? ", "I imagined it was a shelter to help people survive bombing raids", "I imagine it is crumbling inside, and that there are old things like chairs, mirrors or clothes in it." Or even: "Why don't they tear the thing down?" On the bunker's outside walls, glass cases will hold the written memories of former forced laborers, e.g. : "We recall that we always wanted to eat. They fed us once a day; twice a week we got bread, and mornings and evenings there was hot water" "The Germans around us thought of us as mute chattels, although we looked just like them", "Our family survived by chance only". There will also be a sign with a quote from an ordinance of that time: "In Germany, you expect to be treated fairly". The art objects should be set up or mounted by May 2002 at the latest. 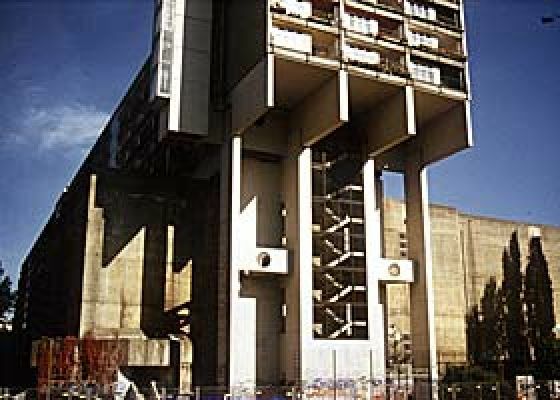 In October 2001, the students plan to interview residents and passersby about their interests and opinions on the bunker and its history. In May 2002, there will be a week of special activities. Guests will include former forced laborers and their descendants, contemporary German witnesses, current residents of varying age groups and walks of life, and youth from neighboring schools. The public showing of this art should give these different generations the chance to compare their experiences of this "Place of Remembrance". Active as well as passive participation in these activities should encourage residents to look more closely at the area in which they live. Through this, we would also like to enter into dialogue about our own history and that of our neighbors then and now. During this week of activities, the newly formed "Place of Remembrance" is to be enhanced by further artistic work, to attract more passersby and residents. For this, the students have already developed the following suggestions: different handmade posters for each day, sound installations, as well as spontaneous encounters with passersby, who are handed objects and texts to look at. After it is finished, the results of this week of activities will be documented and presented in a further exhibition. This "Place of Remembrance" is thus not only a way of dealing with the past, but also presents a message for the present; one that speaks across boundaries, even to the children and grandchildren of forced laborers.